I’m sure you’ve heard the saying before. Something along the lines of “Kids say the darndest things.” Oh, how true that is! As a speech-language pathologist that works with school-aged children, my ears have had the pleasure of hearing some of the most hilarious quotes from my fantastic speech therapy students. In fact, because I have heard so many good ones, 2 years ago I decided to keep track of all the amazing quotes by writing them down in a notebook. You guys, I just hit a major milestone . . .
As of a few days ago, I have added the 100th quote to my notebook and I couldn’t be happier. As my notebook grows with oodles of quotes from speech therapy kiddos, I can’t stop thinking about why some quotes make it into the notebook, and why some don’t. I haven’t set specific criteria that defines what it takes to make it into my notebook, but I suppose the quote in question has to throw me for a loop in some way and cause me to chuckle. That’s a pretty good starting point, don’t cha think? Almost every single one of my friends has asked me, “So Erik, what is your favorite quote so far?” Yikes, that’s tough to answer because I believe that it’s impossible to choose a single quote. I mean, each one has its own unique quality to it that makes it shine and makes it special. But I can tell you about the first quote. Wow! Love it! Where do I even begin?! Well, firstly, did he just call me old?! Haha! But seriously, in my opinion, this quote is beautiful because it perfectly communicates the wondrous imagination of that child. Also, I view this quote as a possible expression of this student’s potential future. He mentioned making medicine, so maybe he will grow up to be a pharmacist? 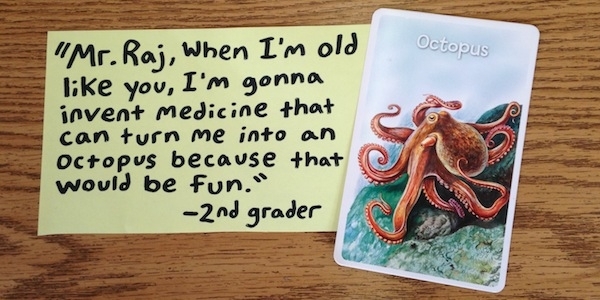 He mentioned an octopus, so maybe he will grow up to be a marine biologist? Who knows, but one thing is certain – he absolutely will grow up to be something great and it brings me pure joy to know that I was able to provide speech therapy services to him. Are you keeping track of quotes said by the children on your caseload? I hope you are because, for lack of a better way of putting it, it rocks! And hey, you never know, maybe the next spectacular quote to change your life just might come out of the mouth of one of your speech therapy students. With that being said, it’s a wise idea to have a pen and notebook handy for that occasion!